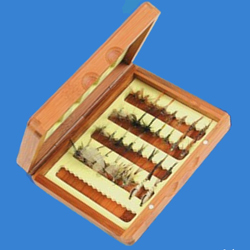 Bamboo Fly Box Classic, a handsome pocket-sized fly box crafted from mellowed split cane. Slotted foam inserts securely hold trout and salmon flies. Brass hinged with magnetic closure this beautiful fly box is lightweight and floats - almost too nice to take fishing. Fly box dimensions, 130 x 100 x 25mm. Flies shown are not included! Wonderful looking and completely practical, superb workmanship. Fulfilled a long time thought that I should have a couple of these boxes, recently I have decided that all my fly boxes will be made of wood rather than plastic or metal. Nearly there, I only have one metal and one plastic fly box left, waiting to be replaced.